The NZ dollar is gaining almost 0.5% against the US dollar in early European trading after the state data showed price growth during the last quarter of the year stayed unchanged at 1.9% in annual terms. The market consensus had called for a slight decline to 1.8%. However, in quarterly terms we got a significant slowdown to 0.1% from 0.9% seen during the three months through September. The RBNZ own gauge of core inflation held at 1.7% at the same time. Delving into some details of the inflation release we may notice that tradable prices, being primarily affected by external factors, fell to 1% from 0.9% in annual terms. Nevertheless non-tradable goods, reflecting domestic price pressures, picked up to 2.7% from 2.5% in the previous quarter, reaching the quickest pace of growth since mid-2014. Of course one swallow doesn’t make a spring, however, this report could be classified as reassuring investors being concerned the Reserve Bank of New Zealand could cut rates in the foreseeable future. While we remain far away from any rate hikes, today’s release confirmed a strong obstacle for lower rates. Taking a look at market-based odds regarding movements on rates we may notice that a rate decrease until the year-end is still priced in almost 20%. At the same time markets assign virtually zero chance to see a rate hike. We therefore stick to the view that the kiwi will be mostly driven by changes in a risk environment predominantly tied to the Chinese economy. Looking broader we do not see too many factors behind the much stronger NZD having in mind that it is the third most overvalued currency in the G10 basket, as per our calculations. 0.8% vs. 0.9% for 2018/2019. 0.9% vs. 1.4% for 2018/2019. It is worth noting that despite outstandingly low interest rates in Japan market participants assign as much as 30% odds to see the BoJ cutting the main rate by the end of this year. We do not think the yen could be influenced by domestic factors in the foreseeable future, instead its valuation should be determined by risk sentiment. The JPY is the fourth most undervalued currency. Apart from the BoJ decision we also got the trade data for December producing a deficit of 55.3 billion JPY compared to expectations for a deficit of 42.3 billion JPY. Exports fell sharply 3.8% YoY while imports increased 1.9% YoY, both figures experienced substantial drops compared to the prior month’s values. The details are not reassuring at all. While exports to the US rose 1.6% YoY, exports to China decreased as much as 7% YoY, the largest contribution to the steep fall in overall exports in the final month of 2018. 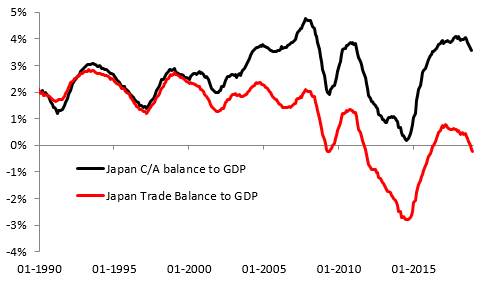 Note that the Japan’s economy has entered a deficit in the trade to GDP ratio for the first time since the beginning of 2016 as illustrated by the chart above.